Aspen Pet containment products give dogs the freedom they crave while keeping them safe and out of trouble in the absence of a fence. Super strong, galvanized aircraft cable, coated with crack-resistant vinyl. 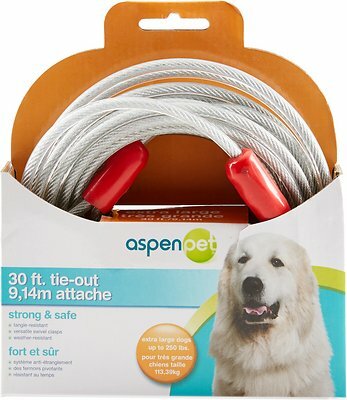 Great for dog owners who don't have a fenced-in yard, this galvanized steel cable is available in a variety of sizes to hold different sized dogs. Cable is made of a strong vinyl coated, steel aircraft cable that is crack resistant. Containment products are utilized for restraining your pet while outdoors. All cable, chain & trolleys should withstand up to 7x the weight of the dog. Remember, containment products should not replace your pet sitter or boarding facility. The Tie-Out cable should be used for supervised containment when outdoors on a picnic, camping, or other outdoor activities. Select a site that is level and free of all obstructions. Attach one snap hook to containment device. Use with an Aspen Pet Trolley, Dome, Spiral Stake, or attach to itself around a tree. Attach the other snap hook to the d-ring on your dog's collar or harness. I purchased this item a couple of days ago and my dogo argentino snapped the part that clamps the cable together he only weights 70 lbs, I'm guessing the cable is rated at a higher limit but the clamp is the weak part and needs improving. My pup is about 60 lbs of pure muscle and excitement. This is a perfect length and very durable thus far. Some of these are defective . My dog got off the lead three times. Had to buy a new one. And needed to make sure the new one did not do the same thing as the old one. THIS CABLE TIE OUT IS GREAT FOR MY 85 LB YELLOW LAB. I FEEL SECURE HE WILL NOT RUN AWAY. I've had this only two weeks but so far no issues at all. I love this! The clasp is easy to use and the strength is perfect! Thank you! !